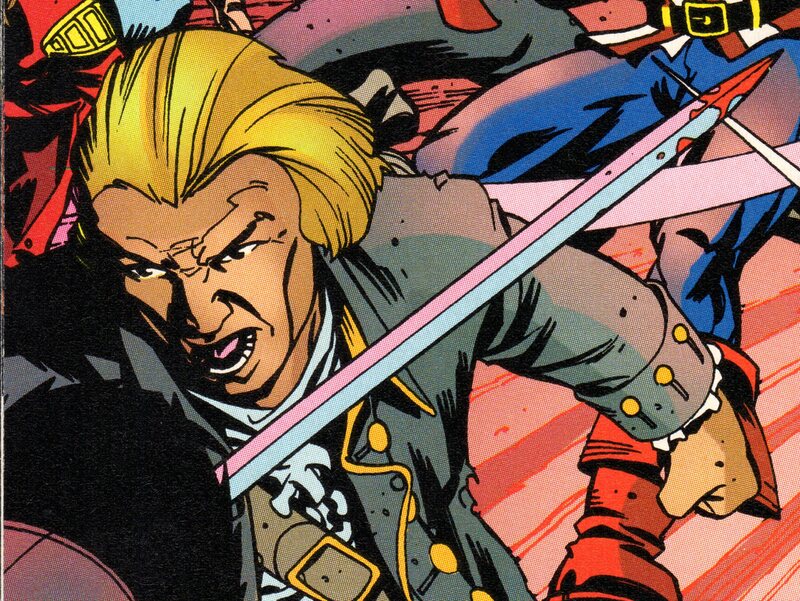 Powers/Abilities: Wallace was an experienced soldier, combatant, and strategist. He was experienced with a sword, and presumably also with a musket and/or pistol. He was loyal to his country, willing to sacrifice his life before revealing his military secrets. He was known to drink heavily (and smoke snuff) in the evenings, dulling his awareness and other abilities. 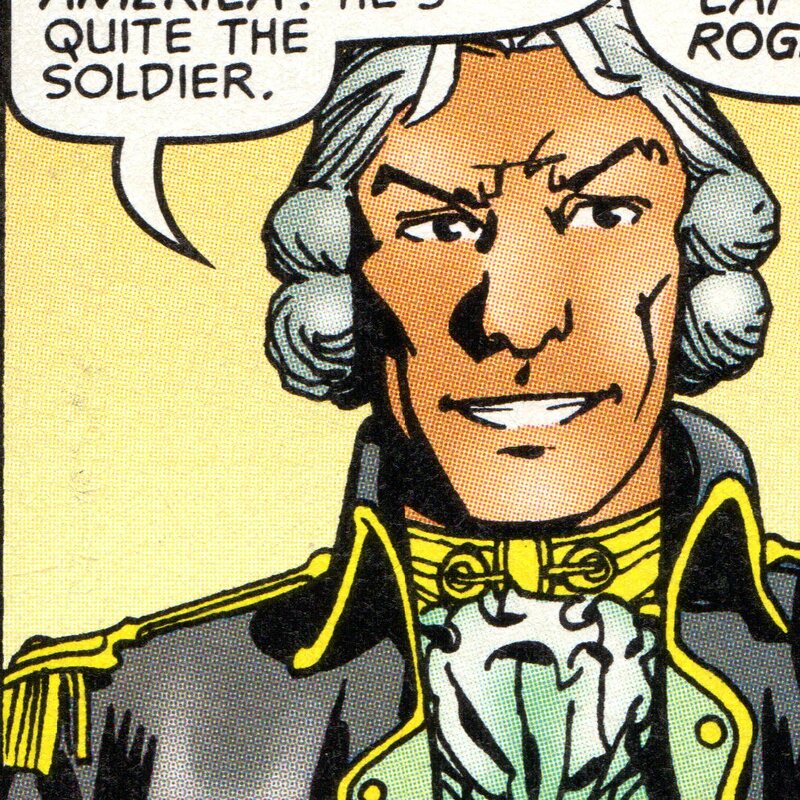 (X-Men: Hellfire Club#2 (fb) - BTS) <1780> - After US commandant Benedict Arnold was exposed as a traitor loyal to the British, Major-General Wallace Worthington was appointed as the city's next commandant. (X-Men: Hellfire Club#2 (fb) - BTS) - Worthington was close friends with Captain Steven Rogers and also fought alongside the costumed "Captain America" at times; Worthing was impressed with the costumed hero as "quite the soldier," but it is unrevealed whether he knew Rogers was "Captain America." (X-Men: Hellfire Club#2 (fb) - BTS) - Lady (Jean) Grey of the Hellfire Club arranged for her protege Elizabeth Shaw to seduce Major-General Wallace Worthington (whose financial status was presently embattled; see comments) with the goal of learning military secrets he would have. Grey and her allies sought to thwart the American revolution and revert America to colonial status under British rule. (X-Men: Hellfire Club#2 (fb)) - At a Hellfire Club party, Elizabeth met with Worthington, along with his ally Captain Steven Rogers, telling her he had fought beside "Captain America." Claiming to be fascinated with Worthington's stories, she told him she had never met of anyone possessed of such a commanding presence. Returning the compliment by noting her to be the most beautiful woman he had ever beheld, Worthington asked her to dance, and she accepted. As they walked away, Worthington -- hinting he had won the favor of the maiden of which they had both been interested -- told Rogers, "Sorry...better luck next time." 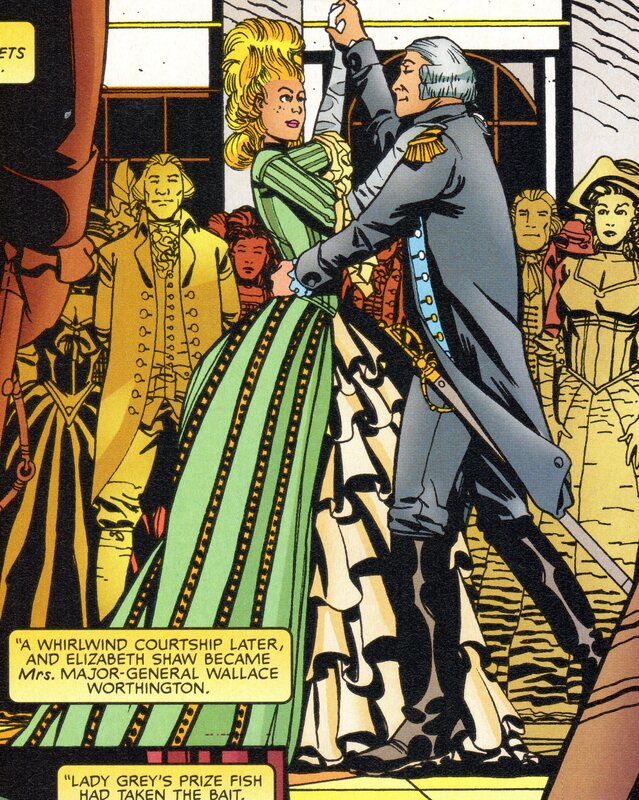 (X-Men: Hellfire Club#2 (fb) - BTS) - Following a whirlwind courtship, Elizabeth became Mrs. Wallace Worthington. (X-Men: Hellfire Club#2 (fb)) - As the war raged on, Worthington battled alongside such heroes as "Captain America" and Ulysses Bloodstone, cementing his reputation in the annals of American history. (X-Men: Hellfire Club#2 (fb)) - Despite her best efforts to the contrary, the fires of greed and ambition died with Elizabeth as she truly fell in love with Wallace. (X-Men: Hellfire Club#2 (fb) - BTS) - <1781> - On a bitter night, Lady Grey chastised Elizabeth for falling in love with Wallace and failing to gain his military secrets. Grey warned that, without these, the American revolution would succeed, and Elizabeth, would have all of her "puppet strings" cut; "...such is the price of freedom." Shocked for a moment, Elizabeth realized that Grey and her allies would attack Wallace directly. (X-Men: Hellfire Club#2 (fb) - BTS) - Elizabeth rushed on foot back to her home. 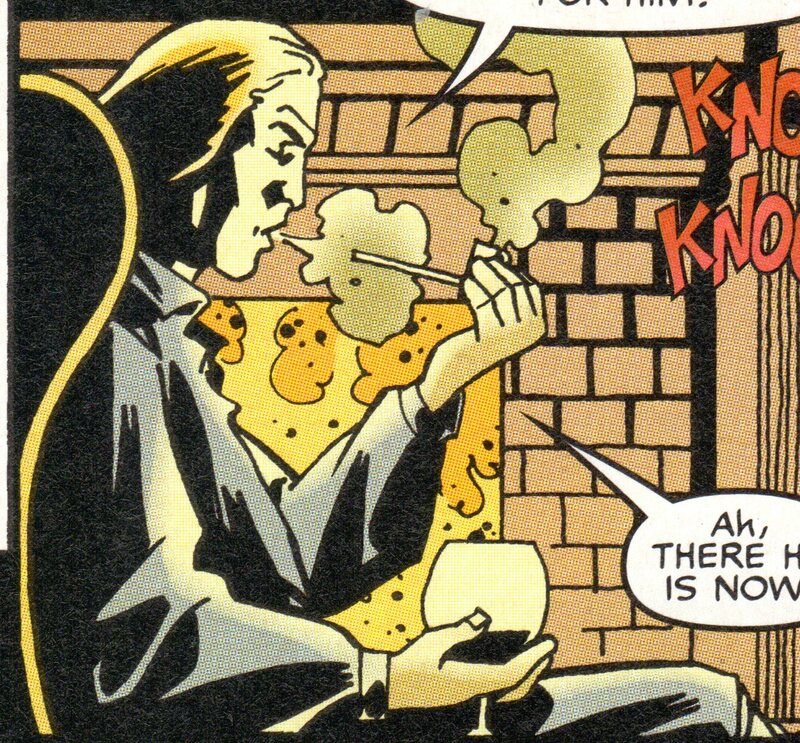 (X-Men: Hellfire Club#2 (fb)) - Soon thereafter, as Wallace had heavily partaken of liquor and snuff while waiting for his friend Captain Steven Rogers to show up, Lady Grey -- accompanied by a pair of strong men -- knocked on the door. Assuming this to be Rogers, Wallace opened the door and was shocked to see Grey and her men. Grey stated that she had come to collect his wive's debt, and her two agents then attacked and beat Worthington. (X-Men: Hellfire Club#2 (fb) - BTS) - Grey demanded secrets, which Worthington refused to give, and Grey's men beat him senseless (and possibly shot him; see comments), leaving him for dead as they set his house on fire and departed. (X-Men: Hellfire Club#2 (fb) - BTS) - Rogers arrived to find Wallace's house aflame. Donning his "Captain America" costume, he smashed his way into the house in hopes of rescuing Wallace. (X-Men: Hellfire Club#2 (fb)) - As Elizabeth arrived, Captain America (Rogers) burst from the burning house carrying Worthington. (X-Men: Hellfire Club#2) - Elizabeth rushed to Wallace's side, apologizing. After telling her he had refused to share the secrets they wanted, Wallace died in Elizabeth's arms. Elizabeth Shaw is listed as an ancestor for Sebastian Shaw, and Wallace Worthington is listed as an ancestor of Angel (Warren Worthington). 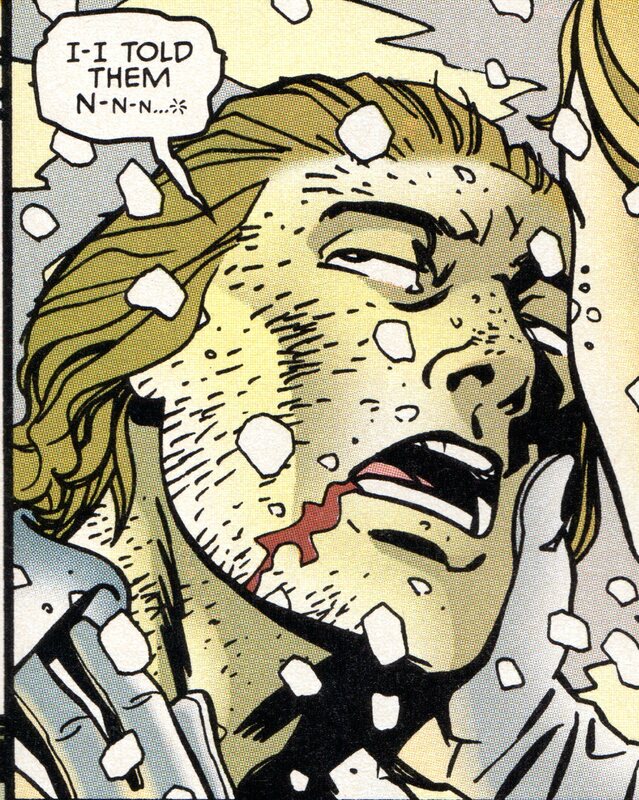 We have no indication Elizabeth was pregnant at the time of Wallace's death, so there's nothing to support that she had a child by him and might be an ancestor of Angel (Warren Worthington) as well, but that is possible. Alternately, Wallace may have had children from a previous marriage, or he may not be a direct ancestor of Warren's, meaning they actually just have common ancestry. However, IF Wallace and Elizabeth had children together, then these children would also be ancestors of Esau, Jacob, Sebastian, and Shinobi Shaw. I don't really know what they meant that his "financial status was presently embattled." Was he getting divorced, or did he have debts or lawsuits or something? After Grey's men grabbed Worthington and Grey closed the door, we heard a "blam!" There's not an obvious gunshot wound on Worthington when "Captain America" carries him out of the building afterwards. Maybe the "bam" was a gunshot fired in the air to show she meant business; or maybe it was Worthington getting smashed against something; or maybe the artist didn't draw a gunshot wound.